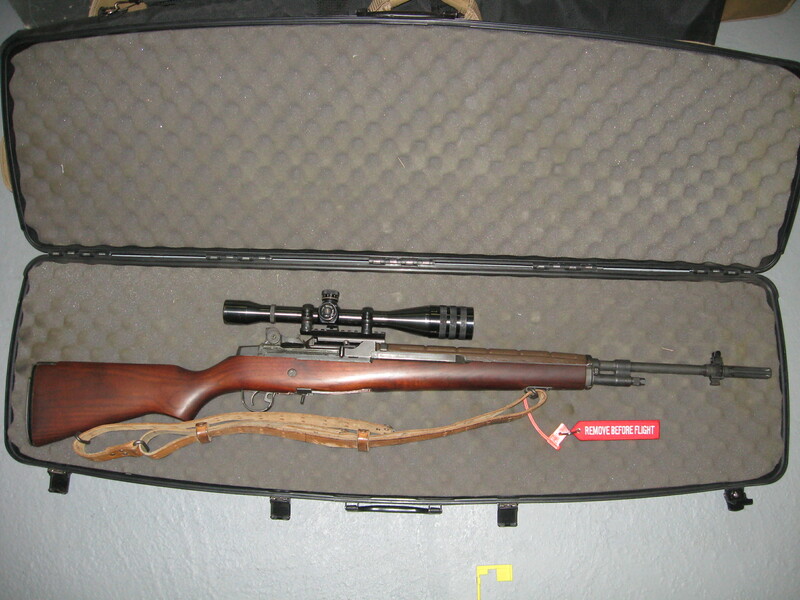 A while back I bought a Bassett mount and a used Weaver T-10 rifle scope. I first tried the mount and scope on my wife's M1A but the scope alignment was way off. Tried it again today on a different rifle, SAInc s/n 033xxx. This one has a SAK standard weight barrel and is match conditioned. It was recently glass bedded in a commercial medium weight stock by Dave Sullivan of West Wind Rifles in Erie CO. I bought this rifle used. If any of you are from Missouri you might know the builder - it was Jerry Bohnert (USMC Ret) who built it for his daughter who (so I've been told) went on to earn a slot on the USMC rifle team. Jerry told me she shot a 198-11X in 600 yd prone with it. Jerry said "it's a hard shooting rifle". I have no idea how many rounds are thru it. The throat erosion is 3. I rarely shoot benchrest but did so today using a Hoppes front rest and rear bag. Had two objectives: (1) See how well it was capable of shooting. I struggle with irons anymore so used a scope and bench. 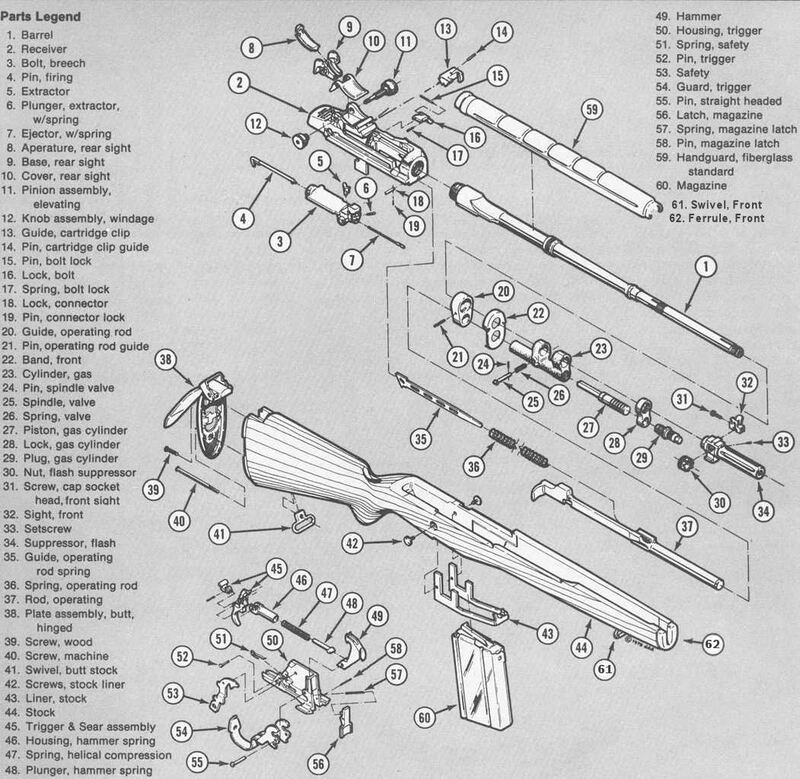 (2) With item #1 as a baseline try the rifle in (a) a USGI fiberglass stock and (b) a USGI big red stock. Got it on paper at 25 yd with the bedded stock then moved to 100 yd. Got it close to center then fired a 10 shot group. The group measured 1.075". Have to say I was stoked -never shot a group with irons that small or that round. Fired with reloads - 168 SMK, IMR4895, GI Match brass. I installed it in the USGI fiberglass and then the USGI big red and neither of them hit a 12" square target at 100 yd so those tests were aborted. 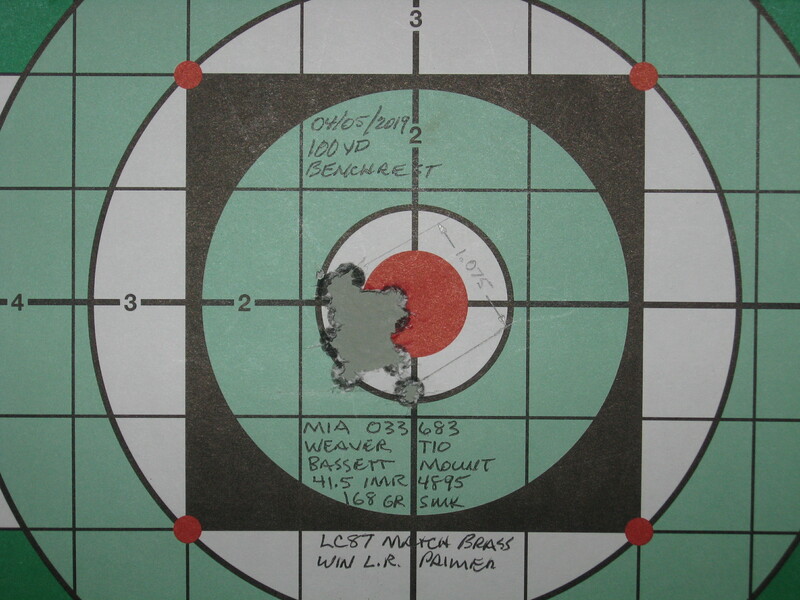 Problem with Bassett mount: Continued to fire after this group. After 30 -40 shots had some surprises then noticed the mount was loose. For install threads were cleaned and mount was torqued with the tool per instructions. When I got home I noticed the end of the mount screw was peened a little. I assume the bolt lug was hitting it. That can't be good. Last edited by NMC_EXP; 6th April 2019 at 06:19 AM. Looks like some mighty fine shooting! That group had me smiling. Wish I could do that with irons. Excellent. Proof the rifle system and trigger monkey work well in unison. Since I started using a spurt of gunscrubber on the mounting hole and bolt, I have not had one of my Basset's come loose. I used brake cleaner on the mount bolt and receiver threaded hole prior to install. The mount bolt protrudes slightly thru the receiver wall and it something is hitting it - I assume the left bolt lug although the rifle cycled just fine. Could be this is loosening the mount bolt. I will file the mount bolt until it's flush with the receiver and try again. I'll clean the threads again as well. I remember my days as a radial drill operator drilling and tapping holes. We were expected to use a set of go/no-go gages for the threads. It was possible for threads to be loose. Could be SAInc's quality control was not the best. As to the trigger monkey's performance bench shooting from a rest is an entirely different game to learn. I shot 60 rounds in this session and never got relaxed and comfortable. Next I may try slung up in prone but with sand bags under the forward hand for stability. Back in the day just being able to keep most of them in the 10-ring was more than enough to make me happy, but shooting tight groups takes it to another level. It was good to learn this barrel is not shot out. Have to admit I haven't ever put a mount on a SAI receiver so I have no expericence in that area. Of the many M14s I own, only one is a SAI product and the thing almost never gets used. It is a Socom II I bought when they first came out and has maybe 50 rnds through it. I'm a fan of the Bassett mount, can't say I have ever mounted one on a SAI rifle but I have on many others, always work well for me. Good deal! I can envision seeing smaller groups once you get into the comfort zone.